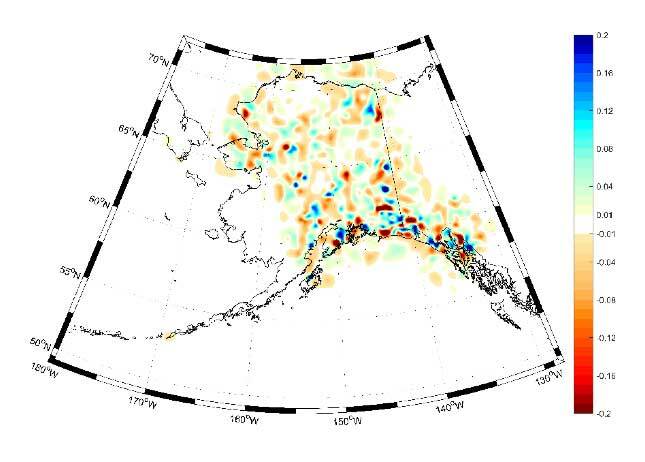 On Aug. 10, the National Geodetic Survey (NGS) released its latest experimental geoid model, xGeoid18. In early 2019, NGS is scheduled to release its next hybrid geoid model, Geoid18. NGS’ 2018 experimental geoid model, xGeoid18, and the next hybrid geoid model, Geoid18, are not the same. This column will address the latest experimental geoid model, xGeoid18, and the future hybrid geoid model, Geoid18, and why it’s important to understand that they are very different and cannot be interchanged. In my October 2015 column, I described the differences between NGS’ hybrid geoid models and their experimental geoid models. It has been three years since I wrote the newsletter that addressed the differences between the experimental geoid model and hybrid geoid models. NAPGD2022 is now only about three years away. There will be significant differences between NAVD 88 and NAPGD2022 height. My June 2017 column provided an estimate of the differences based on the 2016 experimental geoid model, xGeoid16b. These differences between NAVD 88 and NAPGD2022 will vary from state to state, as well as within an individual State. Products referenced to NAVD 88 will be different from products referenced to NAPGD2022. Users will need to prepare for the NAPGD2022 and develop implementation plans. Users should obtain an understanding of the differences between NAPGD2022 and NAVD 88. NGS has a webpage that provides information on all of their experimental geoid models. It page provides information on the development of the program and information on each of the experimental geoid models. 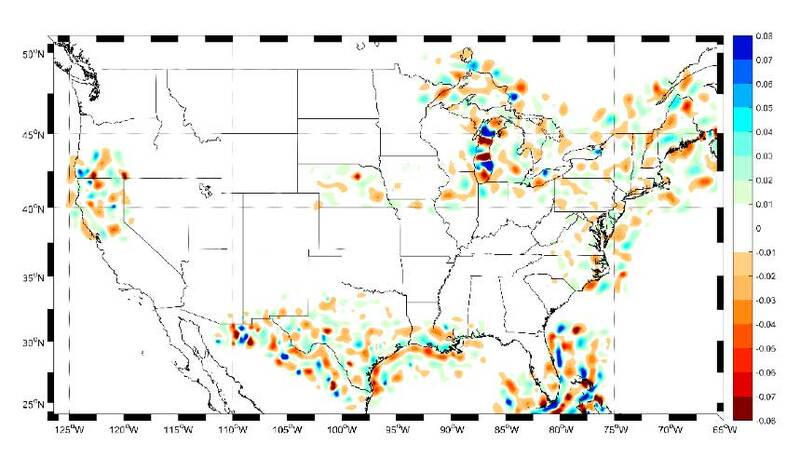 Photo: National Geodetic Survey. Click to enlarge. If the user clicks on the xGeoid18 button (see orange arrow in the box titled “NGS’ Experimental Geoid Web Site”), the experimental geoid model xGeoid18 web page appears (see box titled “NGS’ Experimental Geoid Models 2018 Web Site”). Users should note that the output of the xGeoid18 interactive web service provides the results in IGS08 epoch 2022.00. The output provides an estimate of the NAVD 88 orthometric height based on GEOID12B, an estimate of the NAPGD2022 orthometric height based on xGeoid18b, and the difference between NAPGD2022 and NAVD 88. 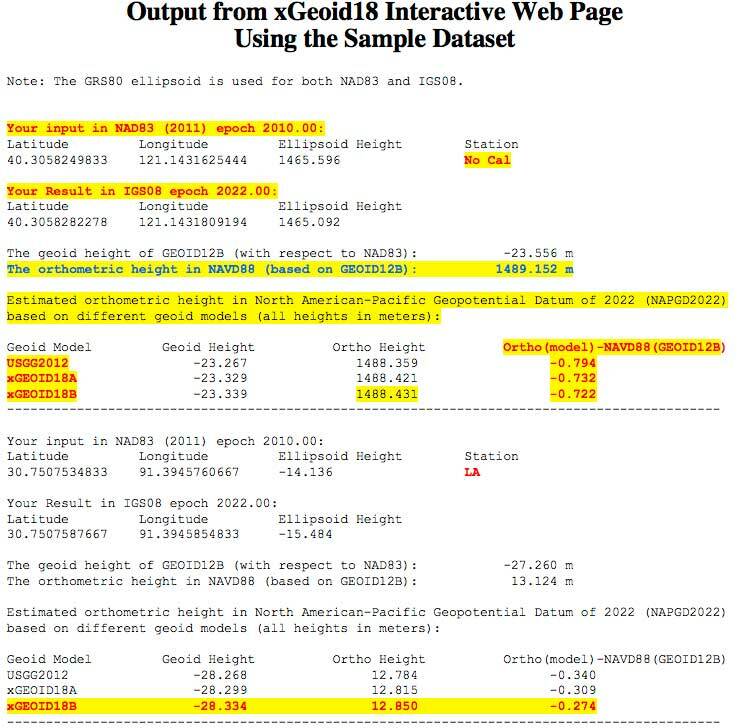 The box titled “Output from xGeoid18 Interactive Web Page Using the Sample Dataset” shows the output from the interactive web service using the sample dataset provided by the web service. 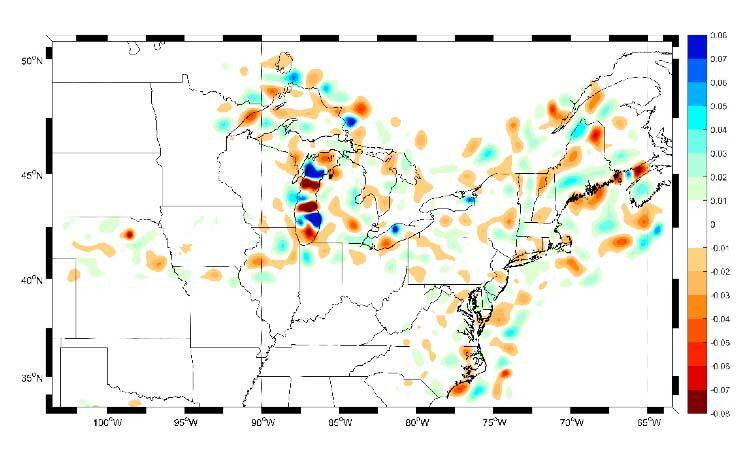 The sample dataset has four stations — a station in California, Louisiana, Michigan and Maine. 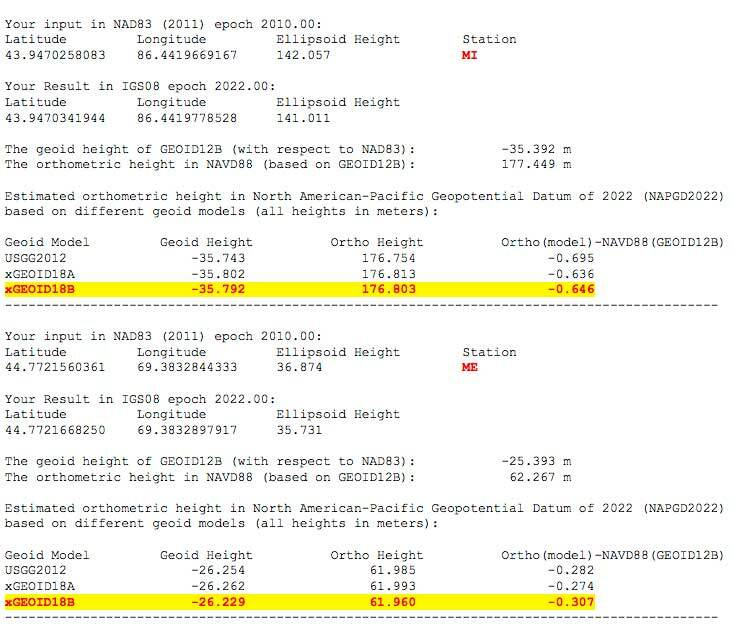 The results indicate that the differences will vary from state to state — the difference between NAPGD2022 and NAVD 88 in California using xGeoid18b is -0.722 meters, in Louisiana the difference is -0.274 meters, in Michigan the difference is -0.646 meters, and in Maine the difference is -0.307 meters (see box titled “Output from xGeoid18 Interactive Website Using the Sample Dataset”). More detailed estimates of differences between NAPGD2022 and NAVD 88 based on xGeoid16b can be found in my June 2017 column. Note: The GRS80 ellipsoid is used for both NAD83 and IGS08. Data: National Geodetic Survey. Click to enlarge. 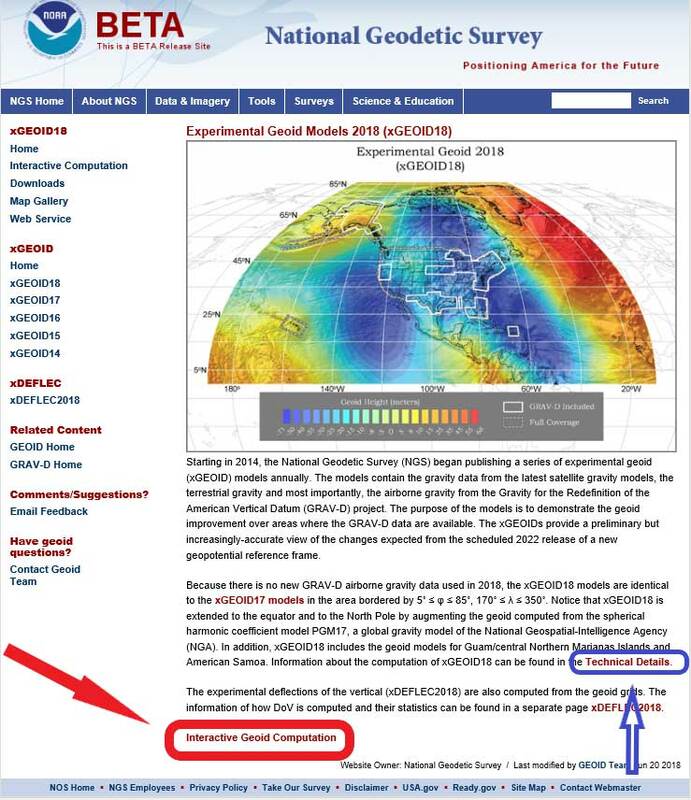 Users can find technical information on xGeoid18 by clicking on the link labeled as Technical Details on the xGeoid18 website (see blue arrow in box titled “NGS’ Experimental Geoid Models 2018 Web Site”). The box titled “Excerpt from Technical Details for xGEOID18 Models” provides an excerpt of the technical details of xGeoid18. xGEOID18 is identical to xGEOID17 in the area bordered by 5˚ ≤ φ ≤ 85˚, 170˚ ≤ λ ≤ 350˚, which includes CONUS, Alaska, Hawaii, and Puerto Rico. Therefore, for information on xGEOID18 in those areas, the user should refer to the Technical Details of xGEOID17. For extended areas down to the equator and above latitude 85˚ north, the geoid is computed from the NGA’s Preliminary Geopotential Model 2017 (PGM17). The geoid models for Guam/central Northern Marianas Islands and American Samoa are computed in the closest way as xGEOID17 using the shipborne gravity, altimetric gravity and the reference gravity model PGM17. The deflections of the vertical are computed from all the geoid grids and the plumb curvature correction is applied by using the classical Bouguer reduction. As the technical detail webpage states, xGEOID18 is identical to xGEOID17 in the area bordered by 5˚ ≤ φ ≤ 85˚, 170˚ ≤ λ ≤ 350˚, which includes CONUS, Alaska, Hawaii and Puerto Rico. Therefore, for information on xGEOID18 in those areas, the user should refer to the Technical Details of xGEOID17. The box titled “Excerpt from Technical Details for xGEOID17 Models” provides an excerpt of the technical details of xGeoid17. This link provides figures that show the contribution of the airborne gravity data to the geoid models. 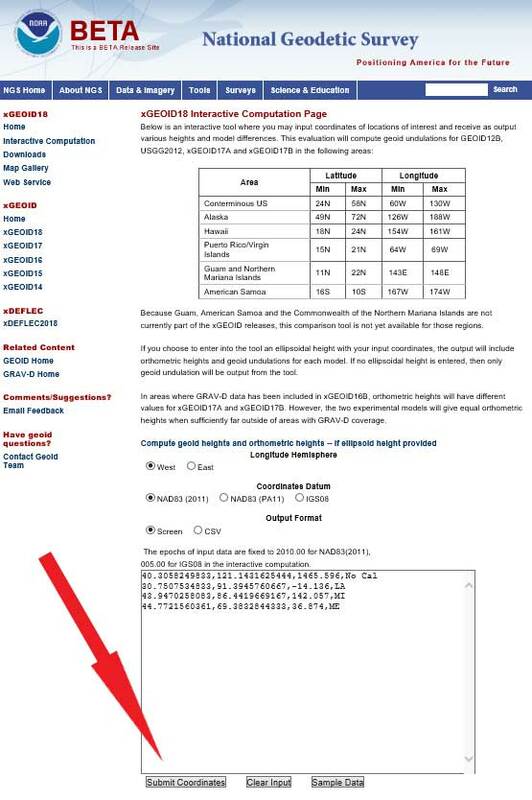 See boxes titled “Excerpt from Technical Details for xGEOID17 Models” and “Figure (2,3,4,5) from Technical Details for xGEOID17 Models.” As stated in the technical details, users can examine each of the regional plots to see where the incorporation of GRAV-D data has changed the values of the xGeoid17B model. The xGEOID17A and xGEOID17B models are identical except that xGEOID17B includes the available GRAV-D airborne gravity data. The difference between the two models shows the contribution of the airborne gravity data to the geoid models. 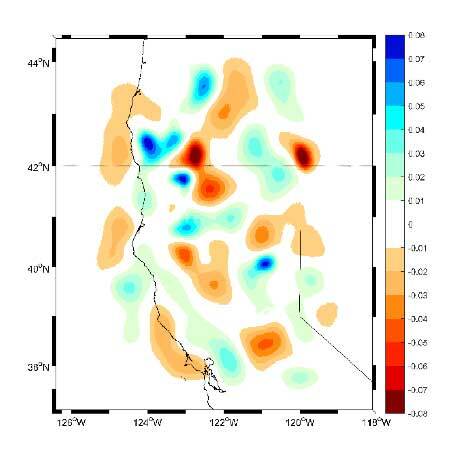 Since the differences are only in areas where the GRAV-D airborne gravity data has been used, examining the regional plots given below will illustrate the varying levels of improvement due to GRAV-D, seen in different parts of the country. What does mean to a user today? A station can now have a published ellipsoid height, modeled GEOID12B value, a published NAVD 88 orthometric height, and several xGeoid modeled values. This can lead to confusion if the user is not careful about providing the correct metadata associated with their data and results. the computed value does not equal the published NAVD 88 leveling-derived orthometric height. In this example, the two heights differ by 2.3 cm. As explained in a previous column, GEOID12B is a hybrid geoid model that is distorted to be consistent with NAVD 88 published heights. 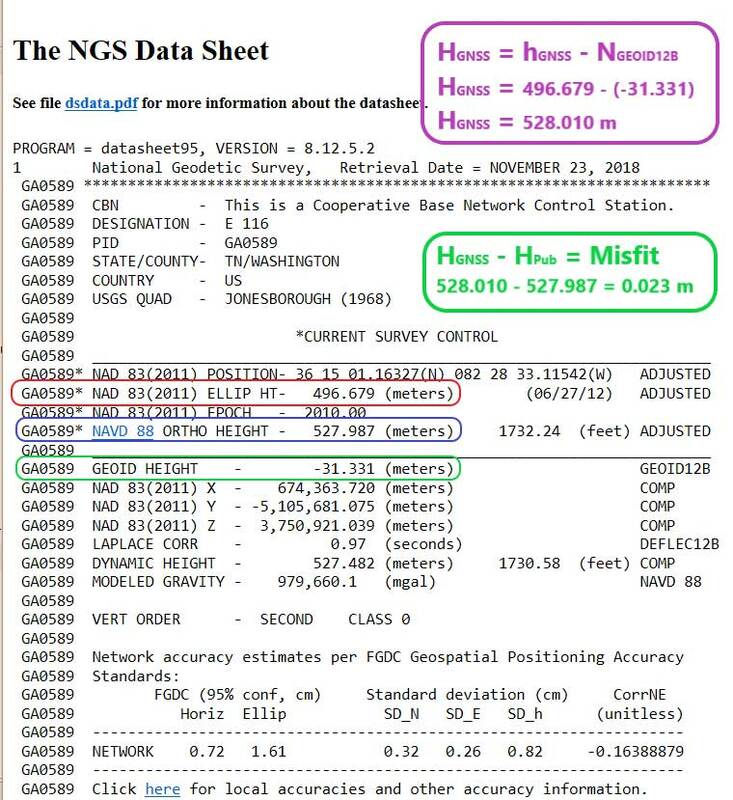 It is a model and the documentation states that “The relative accuracy of GEOID12B to NAVD88 is characterized by a misfit of +/-1.7 centimeters nationwide.” The box titled “Excerpt from The NGS Data Sheet for Station E 116 (PID GA0589)” provides the computations and the results. 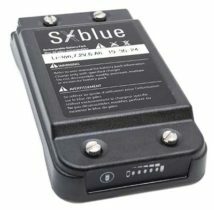 Users can also obtain a xGeoid18B value for the station. The box titled “xGeoid18 Output for Station E 116 (PID GA0589)” provides the output of the xGeoid18 using NGS’ xGeoid18 interactive web service. It should be noted that the xGeoid18 output only provides the NAVD 88 orthometric height using GEOID12B; it does not include the published NAVD 88 orthometric height from the NGS Datasheet. The box titled “Different Height Values for Station E 116 (PID GA0589)” provides three different height values that are currently available from NGS web services. These different heights could lead to confusion if users are not careful. Most users won’t be using the experimental geoid interactive web service to compute an estimate of an orthometric height but all users should provide the appropriate metadata to avoid any confusion. The hybrid geoid model GEOID18 is currently being developed and is not ready to be published, but there is a web page that highlights that it will replace GEOID12B in early 2019 [see box titled “Hybrid GEOID18 Website“] GEOID18 values will be similar to GEOID12B because both hybrid geoid models are made to be consistent with published NAVD 88 values. Saying that, there will be differences especially in areas where the GPS on BMs program identified stations that have moved since the last time they were leveled and, therefore, they were not used in GEOID18. My last column provided an update and status report on stations observed in support of the 2018 GPS on BMs program. Many stations with potential invalid published orthometric heights have been identified by the GPS on BM program. This information will be very useful to the surveying and mapping community as well as to NGS. 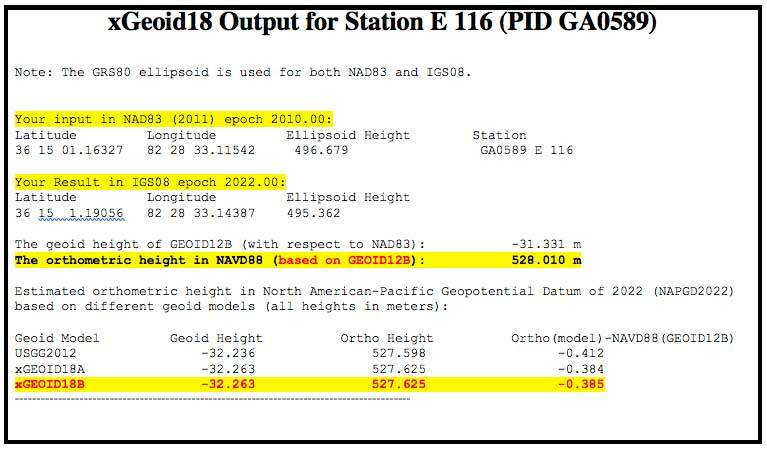 Once NGS publishes the next hybrid geoid model, GEOID18, OPUS results will probably provide an estimate of the NAVD 88 orthometric height computed using GEOID18 similar to what it does now using GEOID12B. In my opinion, the results of GEOID18 will be better than GEOID12B in most areas of the United States and will be helpful in identifying stations that have moved since they were last leveled. NGS’ official date for accepted data for inclusion in the next hybrid geoid model, GEOID18, ended September 21, 2018. Continuing to submit your results to OPUS Shared will provide a way for others to analyze the results to determine whether a station has an issue that requires attention. New OPUS shared results will be very useful for evaluating the reliability of the model. 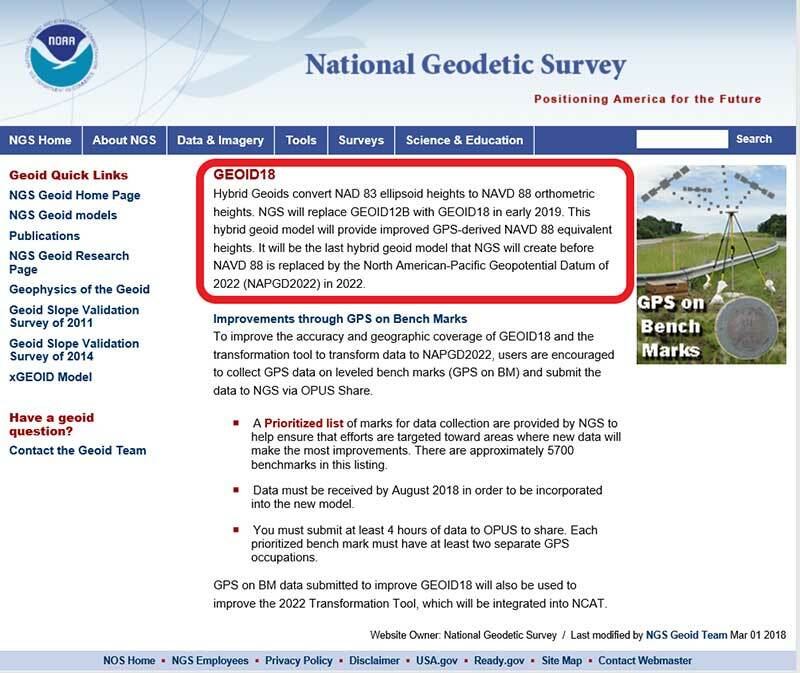 After the hybrid geoid model, GEOID18, is published, NGS’ GPS-on-Bench-Mark Program will expand to include other regions and will focus on data to improve NGS datum transformation tools. Further columns will address differences between GEOID12B and GEOID18 after GEOID18 officially replaces GEOID12B.